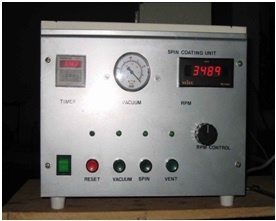 Features: Omiconscientific spin coater unit is used for thin layer deposition of liquid solution or dispersion on the solid substrate. Depending on the rpm of the coater, film thickness could be varied. Performance: 800-6000 RPM, Vacuum chuck (1”x1”) substrate, Purging system, Digital speed control. Applications: The application includes thin layer deposition of liquid dispersions or solutions.